When it comes to Lorelei, the first member of the Elite Four, she will still specialize in using Ice Type Pokemon, continuing to battle with Dewgong, Jynx, Cloyster, Slowbro and Lapras. However, she will also use a Sandslash in its Alolan Form in this battle. This time around, all of her Pokemon will be at Level 61, with the exception of her Lapras that will be at Level 62. Just like your first battle against her, Electric Type Pokemon actually work best against Lorelei's Pokemon Team. This is because almost all of her Ice Type Pokemon are also part Water Types, meaning they are especially weak to Electric Type Attacks. But don't dismiss using a Fire Type or two when battling Lorelei, since her Jynx and Alolan Sandslash are especially weak to Fire Type Attacks. 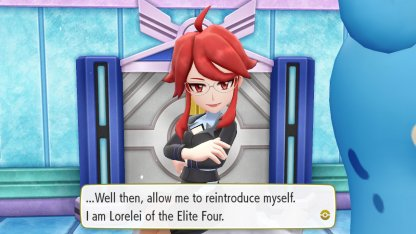 Finally, make sure the Pokemon you do use against Lorelei are at Level 65 or greater, as this will allow you to match up well against her and the rest of the Elite Four.